Free trials have the ability to set up between 1 and 3 prices per video content and an unlimited number of promo codes per video content. After the free trial has ended, you will need to purchase a Premium plan or a 5TB Event plan to get access to the paywall. This guide will help you setting up a promo code. For more information on how to set up a PPV or subscription price on a video, please check out this guide instead. You have 2 options to set up a promo code. Navigate to the MONETIZATION section of a live channel, VOD, package or playlist, as shown below. Please note that you can only add a promo code to a video (live channel, VOD, package or playlist) that already has price. This option allows you to add the same promo code to several video files. The promo code will be the same for all the video files selected. However, please note that the video files selected have to belong to the same category: either you select only live channels, or only VODs, or only packages or only playlists. This will be the code you will give to your viewers so they can apply it when purchasing your video. This code has a minimum of 4 characters and a maximum of 6 characters. It can be a serie of digits, of letters or a mix of both. 4 types of promo code are available. 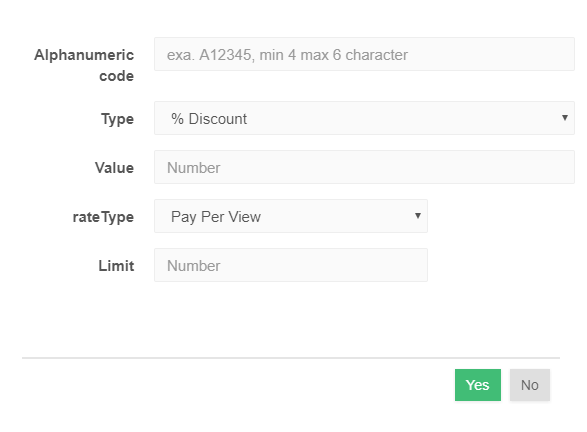 % Discount: The first discount is in %, and when the viewer enters the code they get an amount off equal to the percentage. For example, entering “30” would give 30% off a $10 Pay Per View price, or $3 off for a final price of $7 to whoever enters the code. Money Discount: The second discount method is a flat in $ discount. For example, enter 4 in here to take $4 off the final price. Free Pass Code: The third method for a promo code is a “free pass”. This can be used to grant a select group, who know the code, free access to what is otherwise paid content. Gift Code: The final promo code and the most complex. Selecting gift will create a dropdown where you can select another paid channel/video. Whatever content is selected as the “Gift” will be given for free as an added bonus to the viewer purchasing the main channel/video. For example, sell the live channel for $10 and you can give a previously recorded, on demand file as a gift for people to view. This is where you enter the value of the discount. Promo codes only apply to either all Pay Per Views or all Subscriptions on that stream, depending on which code is setup. Codes do not overlap between the two types of monetization. Therefore please make sure to select a “Subscription” promo code if you want to apply this promo to a subscription price. 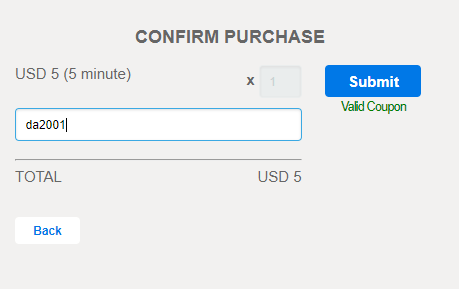 A limit controls how many people can use the code before it expires. For example, a code with a limit of “3” means only three viewers can successfully enter the code before it becomes unusable. If you want an unlimited promo code, just leave the limit area blank. In the field “promo code if available” they will be able to enter the code you gave them. 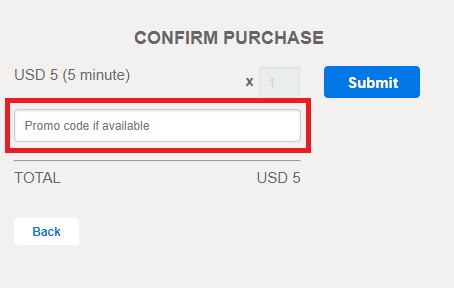 Then, they will click on “Submit” on select their payment method. If you have give them a free pass, they will have to login or enter an email and password if they have not a viewer account yet. Select yes and it is done! your promo code is deleted. Please note that even if you delete a promo code, the viewers you have given it to will still be able to use it.